The methane trapped in frozen water burns easily, creating ice on fire. For some time, researchers have explored flammable ice for low-carbon or alternative fuel or as a place to store carbon dioxide. Now, a computer analysis of the ice and gas compound, known as a gas hydrate, reveals key details of its structure. The results show that hydrates can hold hydrogen at an optimal capacity of 5 weight-percent, a value that meets the goal of a Department of Energy standard and makes gas hydrates practical and affordable. The analysis is the first time researchers have accurately quantified the molecular-scale interactions between the gases -- either hydrogen or methane, aka natural gas -- and the water molecules that form cages around them. A team of researchers from the Department of Energy's Pacific Northwest National Laboratory published the results in Chemical Physics Letters online December 22, 2011. The results could also provide insight into the process of replacing methane with carbon dioxide in the naturally abundant "water-based reservoirs," according to the lead author, PNNL chemist Sotiris Xantheas. "Current thinking is that you need large amounts of energy to push the methane out, which destroys the scaffold in the process," said Xantheas. "But the computer modeling shows that there is an alternative low energy pathway. All you need to do is break a single hydrogen bond between water molecules forming the cage -- the methane comes out, and then the hydrate reseals itself." 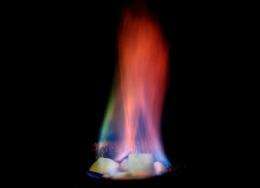 Gas hydrates -- especially methane hydrates, which store natural gas -- look like ice but actually hold burnable fuel. Naturally found deep in the ocean, water and gas interweave in the hydrates, but little is known about their chemical structure and processes occurring at the molecular level. They have been known to cause problems for the petroleum industry because they tend to clog pipes and can explode. A methane hydrate produced the bubble of methane gas that contributed to 2010's Gulf of Mexico oil spill. In previous work, Xantheas and colleagues used computer algorithms and models to examine the water-based, ice-like scaffold that holds the gas. Water molecules form individual cages made with 20 or 24 molecules. Multiple cages join together in large lattices. But those scaffolds were empty in the earlier analysis. To find out how fuels can be accommodated inside the water cages, Xantheas and PNNL colleague Soohaeng Yoo Willow built computer models of the cages with either hydrogen gas -- in which two hydrogen atoms are bound together -- or methane gas, a small molecule made with one carbon and four hydrogen atoms. In the hydrogen hydrates, which could potentially be used as materials for hydrogen fuel storage, a small hollow cage made from 20 water molecules could hold up to a maximum of five hydrogen molecules and a larger cage made from 24 water molecules could hold up to seven. The maximum storage capacity equates to about 10 weight-percent, or the percentage of hydrogen by mass in the chunks of ice, although packing hydrogen in that tight puts undue strain on the system. The Department of Energy's goal for hydrogen storage -- to make the fuel practical -- is above 5.5 weight-percent. Experimentally, hydrogen storage researchers typically measure much less storage capacities. The computer model showed them why: The hydrogen molecules tended to leak out of the cages, reducing the amount of hydrogen that could be stored. The researchers found that adding a methane molecule to the larger cages in the pure hydrogen hydrate, however, prevented the hydrogen gas from leaking out. The computer model showed the researchers that they could store the hydrogen at high pressure and practical temperatures, and release it by reducing the pressure, which melts it. Understanding how the gas interacts and moves through the cages can help chemists or engineers store gas and remove it at will. Willow and Xantheas' computer simulations showed that hydrogen molecules could migrate through the cages by passing between the figurative bars of the water cages. However, the cages also had gates: Sometimes a low-energy bond between two water molecules broke, causing a water molecule to swing open and let the hydrogen molecule drift out. The "gate" closed right after the molecule passed through to reform the lattice. With methane hydrates, some fuel producers want to remove the gas safely to use it. Others see the emptied cages as potential storage sites for carbon dioxide, which could theoretically keep it out of the atmosphere and ocean, where it warms the earth and acidifies the sea. So, Willow and Xantheas tested how methane could migrate through the cages. The water cages were only big enough to comfortably hold one methane molecule, so the chemists stuffed two methanes inside and watched what happened. 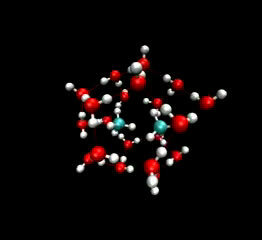 Quickly, one of the water molecules forming the cage swung open like a gate, allowing one methane molecule to escape. The gate then slammed shut as the remaining methane scooted into the middle of the cage. "This process is important because it can happen with natural gas. It shows how methane can move in the natural world," said Xantheas. "We hope this analysis will help with the technical issues that need to be addressed with gas hydrate research and development." Xantheas said performing computer simulations with carbon dioxide instead of methane might help determine whether it's chemically feasible to store carbon dioxide in hydrates. Cold storage solution for global warming? a value that meets the goal of a Department of Energy standard and makes gas hydrates practical and affordable. Which makes hydrate practical? The value of 5 weight-percent (which I assume is 5% weight/volume), or the DoE standard? After all it was only by a DoE standard that Compact Florescent Lights were made practical.